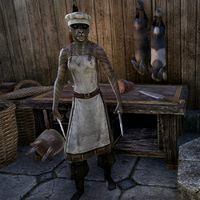 Fishcatcher is a Khajiit chef working at The Boatman's Tail, the inn located in the city of Mistral. When spoken to, she'll say: "Everything this one sells is fresh. Except for what's clearly marked old."